Adelyne is an energetic 4-year-old girl who attends pre-school. Adelyne was born on Mother’s Day, May 11, 2014. She was a healthy and happy baby. Adelyne quickly grew into a very determined little girl, she started walking at eight-months-old and proved she was ready to discover everything she could. Her health was perfect for the most part, however, there were subtle indicators that something was slightly off, but nothing alarming enough to cause doctors to look further. When Adelyne was about four-and-a-half, her mother took her in for her yearly check-up. During the visit, the doctor noticed a slight curve in her back. This was alarming, so they immediately had an X-ray taken. Adelyne’s spine was at a 30-degree curve, which was considered mild. However, doctors referred her to a scoliosis specialist. In October of 2018, Adelyne met with the scoliosis specialist and had an MRI done. That MRI showed some concerning results. It was discovered that Adelyne had a syrinx (or a rare, fluid-filled cavity) on her spinal cord. Having a syrinx is a very serious condition, so she was referred to a neurosurgeon. 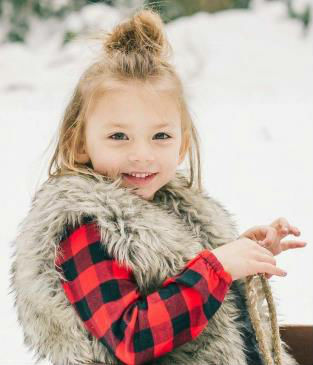 Adelyne was then sent to Portland and met with the neurosurgeon in November of 2018. Several tests were done and the final diagnosis was that she has a condition called, Chiari Malformation (or CM). It is a structural defect in the cerebellum that causes obstruction of spinal fluid outflow. CM can cause headaches, an unsteady gait, poor coordination, curvature of the spine, and several other side-affects. The danger with Chiari is that it inhibits fluids from draining properly into the spinal cord because of a blockage. The only way to treat Chiari is though surgery. In February 2019, Adelyne will undergo a surgical procedure to remove the bone at the back of her skull. This will allow the cerebellum to be placed in its proper position. The hope is that with time, the surgery will also help correct the curvature of her spine. Although, she has many medical hurdles to cross at this point, Adelyne remains one of the sweetest, most helpful, and social little girls you could know. She is always smiling and loves to encourage and help others. Adelyne will be adopted as a Sparrow to Grace Christian School. Students at Grace will work hard to raise money for Adelyne through sponsored community service and fundraising projects.